When they were promoted to the Top 14 in 2013, not many people gave the men from Ain much of a hope, operating as they would be with the smallest budget in the division by some margin. But in the end, Oyonnax shocked everyone, losing only twice at home all season, beating the likes of Toulon and Clermont along the way, and successfully avoiding the drop. 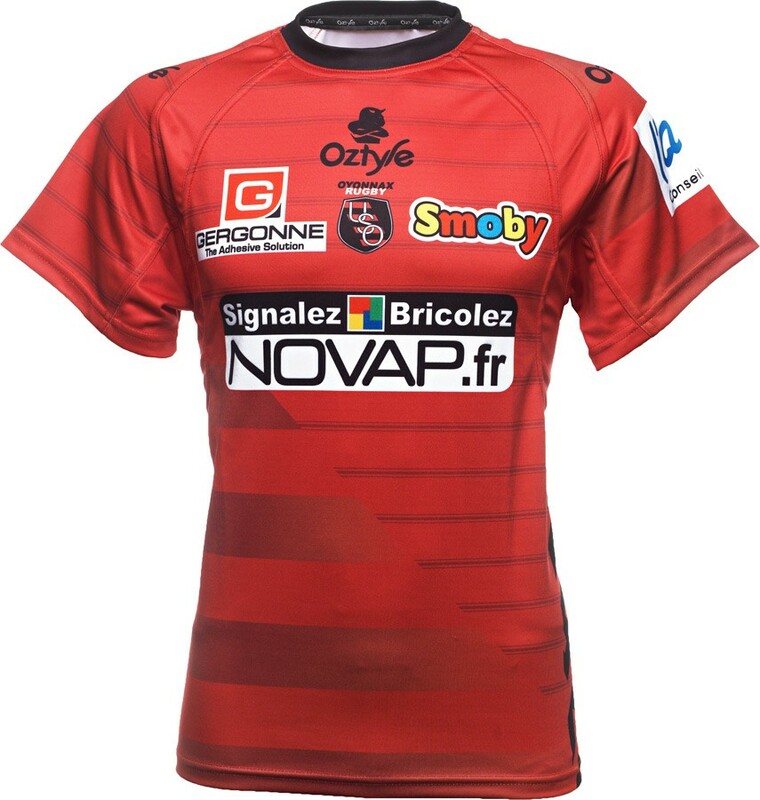 This season, Oyonnax certainly deserve to be taken seriously by everyone, but what about their shirts? They’re produced by a brand you’ve never even heard of, so what gives? Oztyle are probably not a brand you’re familiar with, and if not, please take the time to familiarise yourself with their dreadfully brilliant logo, which appears to be a bull folding his arms as if he’s in a huff with us. Go look, tell us we’re wrong. 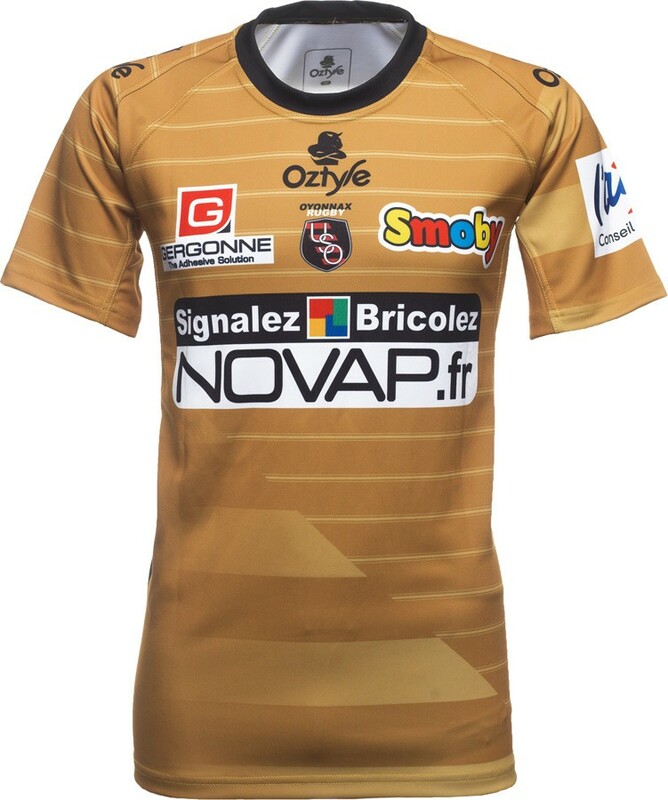 But the brand is actually got a fairly big presence in the lower levels of French pro rugby, so they should know how to make a decent shirt. And honestly… we really think they do – last year’s shirt was a bit of a tacky affair, but this one is much, much better – we love the way the shirt has been split in half, diagonally, with half subtle hoops and half pinstripes. It’s a look we haven’t seen before, and one that’s both very modern and yet clean and classy. But, hang on – nobody gave Oyonnax a prayer of surviving in the big-spending Top 14 last season, and they did, and shocked some of the aristocrats of French rugby along the way. That in itself is a massive achievement, and one worth celebrating. We’re still not sure it’s worthy of a gold shirt, but we can’t help but like this one – it makes the hoops/pin stripes a little more evident, and there’s little doubt black and gold go very well together. Oyonnax aren’t going to win the league any time soon, and surviving for a third crack at the Top 14 would be a massive achievement for them this year. But each year they’re in the top flight, Ozstyle seem to be improving their shirt designs, so for that reason if nothing else, here’s hoping they keep up their success.